A can opener is the one item as a vegan which you are going to be using. A lot. But it's just as much an investment in your cooking as it is in your sanity. Do you know that feeling of epic frustration when you get the blade to pierce the lid, but then it just spins around in circles? You end up with a partially opened can that's totally dented. The next thing you know you're struggling and cursing, stabbing at the can with your crappy can opener while your dinner burns. That's no way to live! If you have an old-fashioned manual opener that's hard to turn and leaves dangerously sharp edges, it's time for an upgrade. 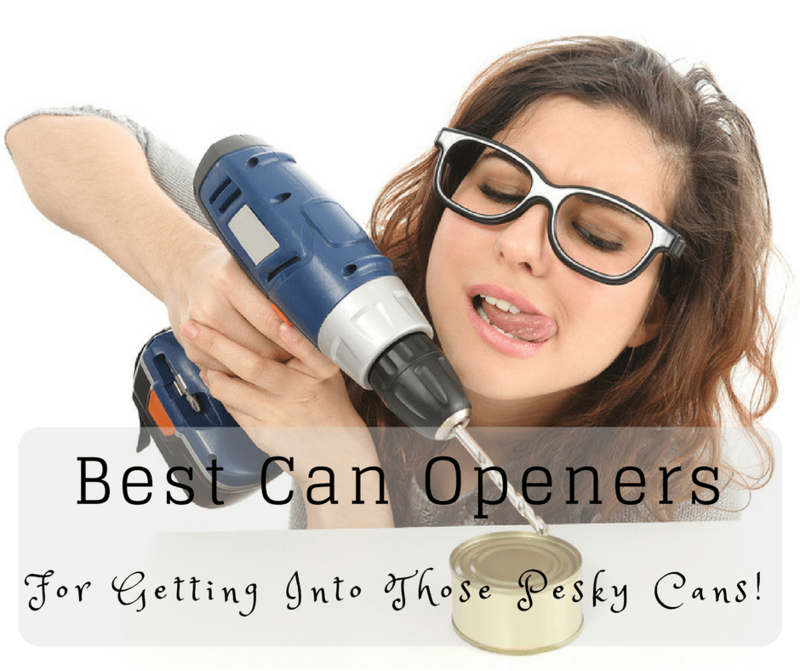 You may think the best can opener is simply one that opens the darn can, but as I discovered when upgrading my kitchen, there is so, so much more. 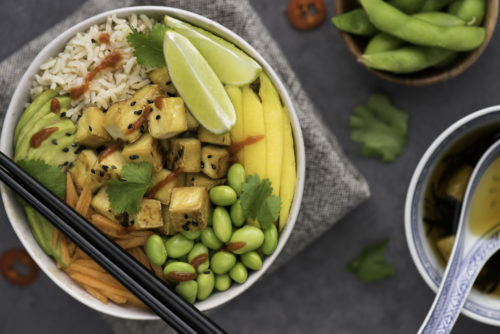 ​From the stylish ​looks to the clever gadgetry, using magnets to hold lids and side cutting blades, it's the best out there... if you have the counterspace to spare. Check Out the Hamilton Beach Smooth Touch Can Opener! ​Magnet ​feature makes removing sharp can lids a breeze. Comfy design too. ​OXO have innovated the way you open cans​: from the side, using your wrist. Very clever​. ​The two primary types of can opener are manual and electric. Each comes with its own pros and cons. Manual openers are small and inexpensive. The most popular butterfly-style must be hand-turned to make the lid slide through the two cutting blades. Older people, those with arthritis, or anybody hand-strength issues may find this type of opener difficult to use. They’re also usually not dishwasher safe and may rust. Campers may prefer a lever-style opener that punctures the lid and pries it open or a simple church-key style that simply punctures a hole in the can. These openers are both small and portable, but not ideal for regular kitchen use. Electric openers are far easier to use, but they’re more expensive and take up space on your countertop or in a cabinet. They usually operate with a simple push of a button and have a magnet that holds the can in place while it's being opened. Some electric openers are specially designed to take up minimal space, which is a bonus for those with small kitchens. If you open cans frequently or have trouble with hand-strength, you’re probably better off with an electric opener. The best kitchen tools have a simple design, are easy to use, and durable enough to last for years. Can openers are no exception. While they all serve the same basic purpose --opening a can -- you’ll be surprised how many different ways there are to go about it. Here are some of the features to consider when evaluating can openers. One of the first things to consider is whether your can opener will be used strictly in your kitchen. If portability is important to you, a standard electric opener is probably (and obviously!) not a good choice. Also think about the size of your kitchen and how often you use a can opener. For some, a small tool that can easily be stored in a drawer is the best option. Others may want a large electric opener that they can proudly display on their countertop...or just avoid having to open a drawer time. Can openers work by cutting either along the top of the can or at the side where the lid meets the base. Top-style can openers leave a sharp edge, and it’s possible that the lid can fall back into the can once it’s open. This style of can opener remains popular in North America, but many of the new ones include a magnet to hold onto the lid once it’s removed. Side-style openers leave a smooth edge on both sides, making it safer to use. The design also prevents the blades from coming into contact with your food. This is more sanitary and reduces the need for frequent cleaning. Always look for a can opener that’s constructed of durable material and has a quality design. No matter what type of opener you choose, you’ll want it to have stainless steel blades. They are the most durable and also rust-resistant. An electric can opener should be large enough to accommodate various size cans and heavy enough so it won’t flip over during use. 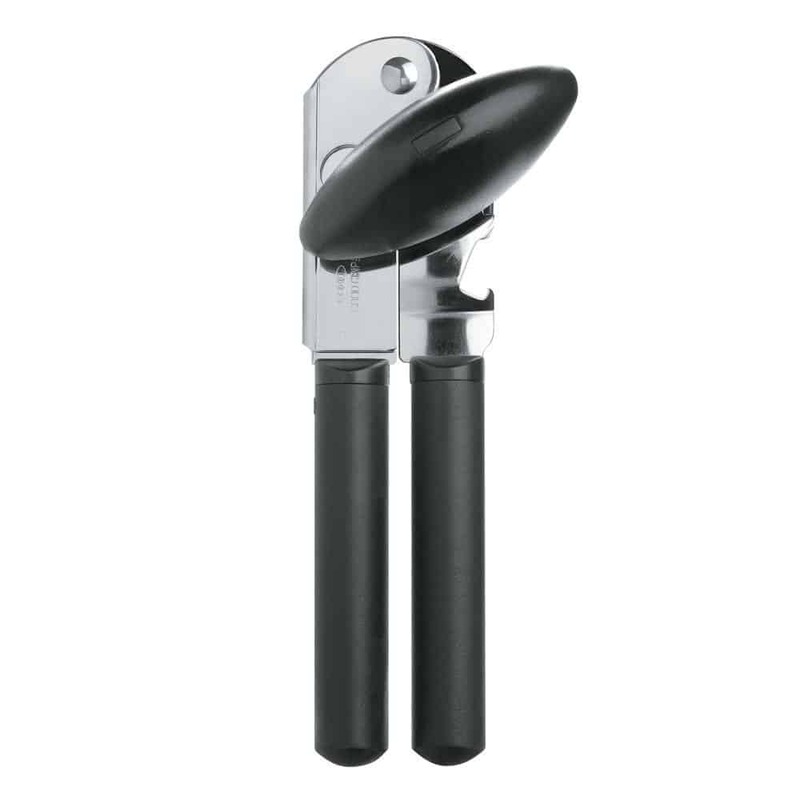 Manual can openers should be easy to turn and have a handle that feels comfortable in your hand. You may also want to look for one that leaves a smooth edge, so you don’t have to worry about cutting yourself while removing the lid. This top-style manual can opener has a unique design that addresses many of the common problems people experience with this type of opener. It has a soft-grip handle that’s comfortable and easy to use. When you attach it to the can, it locks on, making it easy to use without a lot of hand fatigue. When you’re done, simply press the release button and - ta-da! -the magnet pulls the lid right off. ​There's a lever you press that then disengages the magnet so you can dispose of the lid easily. This opener is sturdy​, comfortable to hold, with the customary stainless steel blades and comes with a five-year guarantee. It can be cleaned by simply wiping down the blade with a cloth. ​Check Out the ZYLISS Lock N'Lift! The handle used to operate the Hamilton Beach Smooth Touch is ergonomically-designed, making it an extremely easy can opener to use. It’s perfect for those with hand-strength problems and can be used by the elderly and even children. 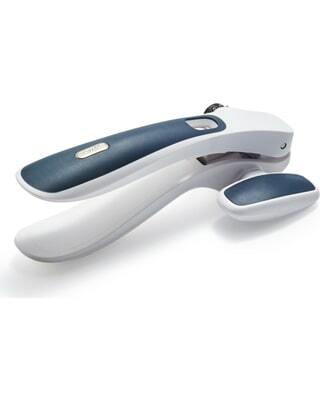 This is one of the few electric openers that uses a side-cutting design, so there’s no worry about sharp edges. It also minimizes the blade’s contact with food. Since the lid stays on until you lift it up, there's less chance for spills and splashing. The powerful magnet holds the can in place while the machine operates, and also prevents any tiny metal slivers from getting into the food. It’s not too big, measuring 5 by 4 by 9 inches, and the black and chrome design looks great on the countertop. There’s also an opening in the back that holds the power cord out of the way. This opener works with all standard-size cans and comes with a one-year warranty. ​Check Out the ​​Hamilton Beach! ​I never knew these things existed - a countertop can opener that sits under the lip of your counter. As you can imagine, coming from Back & Decker this is a versatile and serious looking piece of kit. ​It works not only as a can opener but can also open bottles, sharpen knives, and cut bags. Ideal if you were surviving in the wild and had a kitchen with a countertop with you. It measures approximately 6.5 by 7.5 by 5 inches and is designed to mount under your kitchen cabinet, eliminating countertop clutter. There’s a space in the back of the unit to hold the power cord, and a swing-open door covers the unit, giving it a sleek look. The opener holds the can tightly as it operates, and has an automatic shut-off feature. As long as there is enough space between the opener and your countertop, it can handle all size cans. It should be noted that this unit can be difficult to mount on some cabinet types​ depending on how far the lip of your cabinet extends. 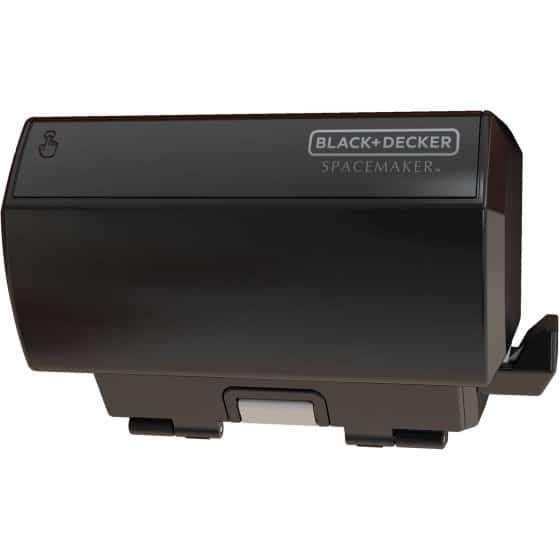 ​Check Out the ​Black & Decker Spacemaker! 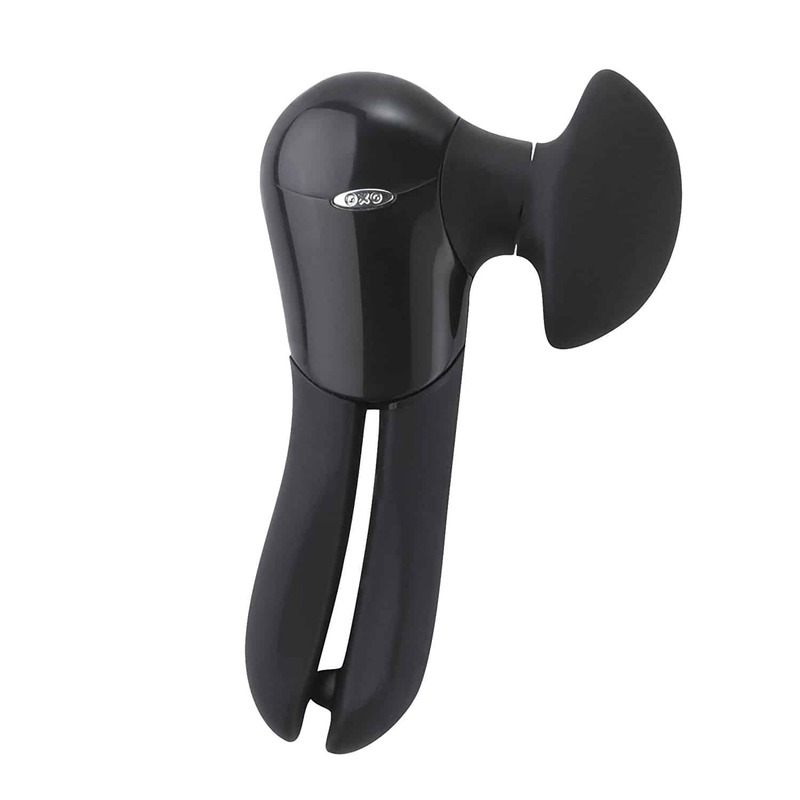 The OXO Smooth Edge has a patented side-turning design, a soft-grip knob, and non-slip handles. Basically solutions to all the things that were horrible about manual can openers. Also, the side-cutting tool (of course, why not cut from the side!?) creates smooth edges and works quickly and easily. It can accommodate cans of all sizes and shapes, and ​works fine with dented cans. ​There is one thing to take note of with this - and any manual side cutting can opener. ​Check Out the OXO Good Grips Smooth Edge! ​The two factors that really come into play here are whether you have counter top space and whether you fancy the ease of an electric can opener. I personally have enough extra space in my kitchen, so I’ve chosen the Hamilton Beach Smooth Touch Can Opener as my top pick. 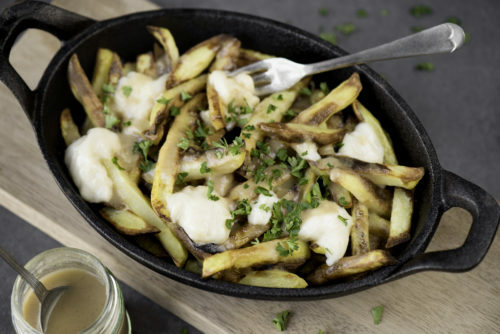 I love that it’s super easy to use and it is a thing of beauty on the countertop - ​stylish without being too space-age looking. The black and chrome design fits perfectly with the rest of my kitchen décor and it feels sturdy enough that I’m confident it will last for years to come. 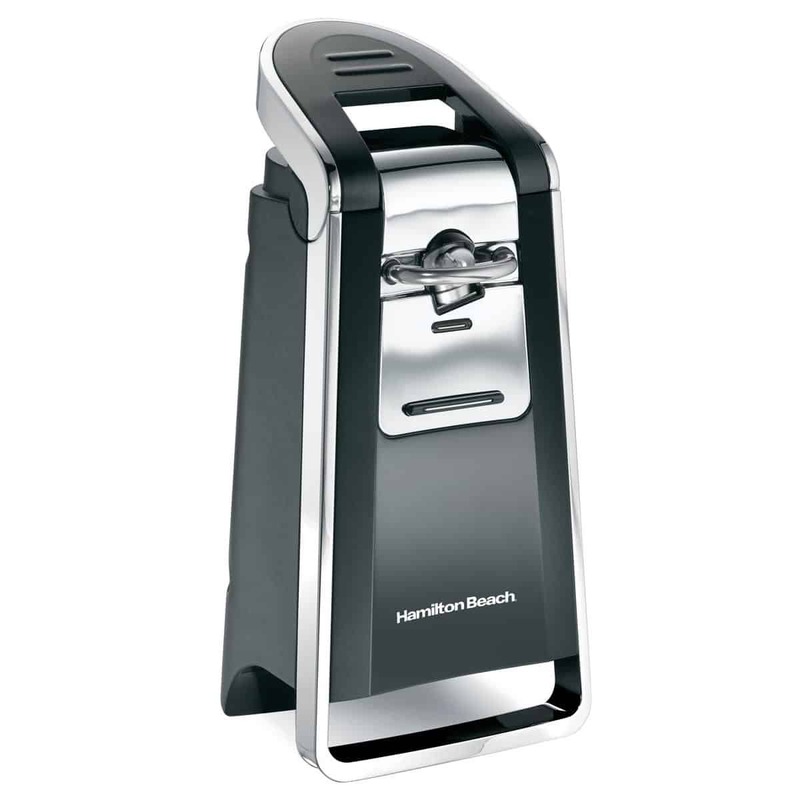 ​Check Out the ​Hamilton Beach Smooth Touch Can Opener!